And that is why it is called Present! A new perspective on well-being was opened to me with the insights from Mr Tolle’s book. He manages to deconstruct a quite essential subject in a very down-to-earth manner. However, what a challenge he places on our table! Basically, he claims that the only way to achieve our well-being at all levels, mentally-emotionally-physically-spiritually, is by living and being in the “Now”! Past and future don’t exist! “Excuse me?” you may well ask. Well, they don’t exist, really. Think about it — the past is gone, and the future isn’t yet here. We can only live today, right now, in the Now! Living in the past only creates frustration; living in the future only creates anxiety! But you might say: “Well, but my past is my reference, my past is part of what I am! I can’t just ignore it and refuse to acknowledge it!” Yes, you're right but — the only way we will “build a past to be proud of; a memorable past” is by making sure we’re living a congruent life. When? Today, in the Now! Same for our future. You might say: “But if I don't need to care about the future, because it doesn't exist yet, what about my ‘future’? I mean, what about planning for a better life, professional goals, planning to have a family, children?” Yes, we all have to have goals, plan for our future, aim for a better life, and improve ourselves, but — we can only do all of that — when? Today, in the Now! You see, there’s no way around it. If we really want to improve our lives, live fully, tackle a problem or situation in order to move forward in our lives, in order to evolve and grow, we can only do it — today, in the Now! Tolle’s core message is that most of us spend our whole lives worrying, instead of living, simply because we don’t live in the present. We worry about what we haven't done, what we might have to do; or maybe should have to do or what we could've done; or, if I’d only known, I could’ve — whatever. Again, we’re neglecting the Now, today. We need to plan, of course, but we have to take action, today, in the Now! A problem is only a problem if no action is taken about it. When we do act, it then becomes a “project”. The message is clear and simple: instead of sleeping on our problems, issues, situations, we ought to take action and transform them into projects. We can plan for our future, set our goals, and organize the tasks, and we can do today what corresponds to today. The tasks for tomorrow, do them in tomorrow’s today. And, if we are conscious of that, and put it into practice, when we look back, when we look to our yesterday, our past, even if there are things we believe should still be improved, we will have the certainty that we did the best we could with the resources and knowledge we had at the time, in the past’s today. And today we can improve them with the resources and knowledge we’ve accumulated, which will contribute to a better tomorrow. Simple? Yes, the concept is. Easy to implement? Not at all! It requires the willingness to make that leap to change, when only you know when enough is enough! This whole concept was a true revelation to me. It really made a substantial shift in my way of seeing my life, the situations and people around me, and, most importantly, it released an enormous weight from my shoulders! Once I understood that the only way to have a balanced and fulfilling life is living today, I stopped worrying about tomorrow, because it doesn’t really exist! Only today matters! So, instead of creating factitious issues for tomorrow and turning them into problems, thus generating anxiety, suffering, frustration, depression, and so on and so forth — let’s live today, work on our projects today, enjoy our moments today, live life fully, today! Not yesterday, not tomorrow, Today! I personally know people who’ve spent and keep spending most of their lives and time waiting — waiting for the right time to do X, Y and Z; waiting for the right time to wear, or use, something that was given to them; waiting for the right time to — start living! The only day to prepare, for a memorable past and an amazing future, is today! It is a work in continuous progress; it requires a permanent state of awareness and constant vigilance. But speaking from my own experience, it’s worth it. Let’s not waste it! 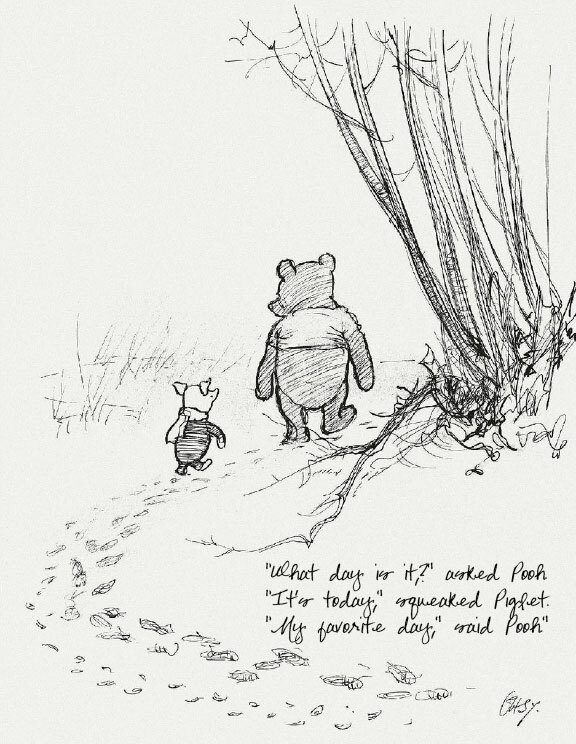 "It is today", squeaked Piglet. "My favorite day"! said Pooh.